State, Federal and OSHA labor law posters are required posting s that must be posted at the workplace when there are one or more employees. Posting current posters as laws change is mandatory as well. 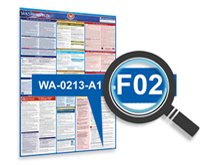 The Complete State, Federal, OSHA Labor Law Poster satisfies this requirement. posters & auto-ships new posters. Need a labor law poster option that comes with an unlimited posting violation protection guarantee? Select from our plan that either ships the first poster and auto-ships new posters upon change or our plan that will give you instant access to recent and future updates. Labor Laws change frequently! updates for the next 12 months! Federal Labor Law Posters are required to be posted at every site along with the State Labor Law Posters. Federal posting requirements extend beyond just general labor laws. Depending on your industry, you may need additional postings and depending on your needs, you may need an applicant poster or a bilingual poster. safe and to reduce workplace injuries. Employee attendance and the management of attendance can be a tedious task that involves tracking, paperwork, and documentation. management tools that have helped other businesses. Employment documentation can get very time consuming and specific. Forms for pre-employment, hiring, during employment, and separation varies and we have the forms to support any need you may have. 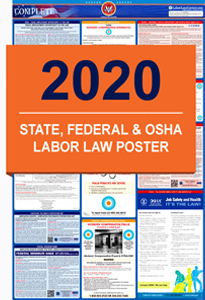 2019 Labor Law Posters Are Now Shipping! Answer a few simple questions and we'll instantly recommend a list of mandatory posters you need to be compliant. "I purchase the state and federal poster for all my stores. This is the reason that I keep coming back. One posting, great pricing and speedy delivery....and always helpful when calling. " "The ease of doing business with the LaborLawCenter is excellent. Customer Service attention to detail was great. " Check To See If Your Posters Are Up To Date. Labor Law Center provides labor law posters and compliance services from small, single location businesses to large, multiple location corporations. Our federal, state and OSHA labor law posters are specifically designed to meet business needs and compliance requirements. Whether your company buys individual posters to ship to a single location or needs a year-round labor law poster service, Labor Law Center has you covered. We also handle federal contractor labor law poster requirements and industry-specific requirements. Each labor law poster from Labor Law Center is backed by our 365-Day Satisfaction Guarantee. Our Replacement Service for labor law posters comes with an Unlimited Compliance Guarantee – meaning we pay all posting fines, no matter the cost. With over 13 years in business, we've never incurred a single labor law poster violation.